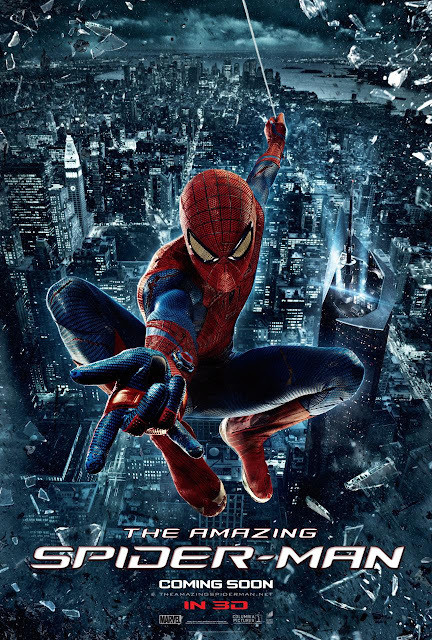 Not to be out done by The Avengers and Batman, 'The Amazing Spider-Man' has relased his latest trailer, directed by Marc Webb's 'The Amazing Spider-Man ' stars Andrew Garfield, Emma Stone, Rhys Ifans, Denis Leary, Campbell Scott, Irrfan Khan, Martin Sheen, Sally Field. Check it out in full 1080p over at itunes. 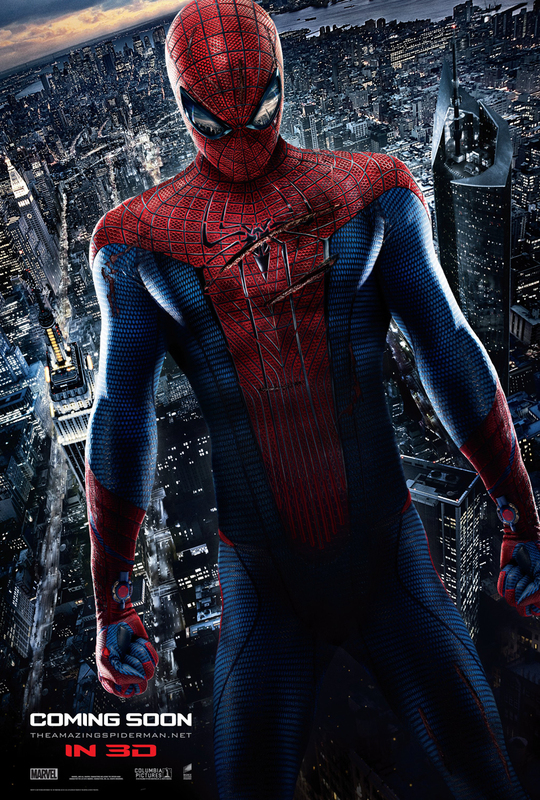 'The Amazing Spider-Man' is the story of Peter Parker (Andrew Garfield), an outcast high schooler who was abandoned by his parents as a boy, leaving him to be raised by his Uncle Ben (Martin Sheen) and Aunt May (Sally Field). Like most teenagers, Peter is trying to figure out who he is and how he got to be the person he is today. Q: In the earlier teaser, some of the POV web-swinging seems a lot more CGI than it does now. Is that an evolving process? Marc Webb: We were still in production when we made that trailer, I believe. That was a very early rendering of some of the CGI things. Part of the fun was to create the movie thinking about subjectivity, meaning getting to feel what Spider-Man feels. I thought that 3D was a really interesting way to exploit that. We spent a lot of time refining and just making that s--t better. So there is that in the movie, but it’s a much more refined version of what you had seen before. Q: How much of the film features those POV segments? Webb: It’s interspersed throughout the film. It's not like the third act is all point of view. Though that's an interesting idea! [laughs] I’m not that bold. Webb: Oh! [laughs] You'll have to see the movie. Q: So it's intentional mystery? Q: Can you talk a little bit about bringing the Lizard to life and how, technically, you accomplished it? Webb: There’s a lot that goes into it. I mean, when we shot those sequences, we actually shot a human. There was a combination of things. A guy, Big John, who was this guy who was literally a big guy named John, who did a lot of the interactive stuff. When you're trying to interact with Andrew or with Peter, you need someone grabbing him and doing those things so we would replace him with computer-generated Lizard. Then the performance capture was done with Rhys and, for that, we would shoot Rhys in a similar environment and get his facial composure. We're still working on it. I actually just came from SPI [Sony Pictures Imageworks] where we're trying to incorporate his performance into the Lizard itself. That takes an enormous amount of time. It's tricky, you know? In the comics there are different incarnations of the Lizard. There's the MacFarlane one, which has the snout, but I was interested more in finding something that could relate human emotions. I wanted to keep Rhys's performance in that creature. Performance -- Pixar does it extremely well, creating those emotional qualities within characters that are, essentially, computer generated. So Rhys's performance is giving that nuance, getting the eyebrow tics and the looks. Creating an armature that can actually speak and lips that make sounds. It's a very detailed and, frankly, tedious process. I really wanted to capture emotion. I wanted him to have a face, have a feeling and that's the way I chose to do that. Then there are the physical components of it. I wanted to make him very powerful. I wanted to make him stronger than Spider-Man. That was a really important part. Q: We see a lot of on-screen spectacle in this trailer. How do you balance your approach to providing the thrill ride that people want with the fact that Spider-Man is one of the more down-to-Earth heroes? Webb: That's the thing for me, that access point. I was always a Spider-Man fan, but I was a bigger Peter Parker fan than a Spider-Man fan. When you see the movie, I don't think anybody will be worried about the emotional part of it. There is an incredibly innocent and tender quality to Peter Parker. He's not a billionaire. He's not an alien. He's a kid and he doesn't have money. He has trouble with the people that raise him and he has trouble talking to girls. There's that intense relatability that's all throughout the movie. I wish you were in the edit room. I could show you scenes that would describe it, but I think you guys have now all seen the hallway stuff. That's a texture that, for me, is really intuitive. It's just something that I love in movies, that particularly romantic dimension. It's something that I'm very familiar with: girls and being made nervous by women. But again, there's that relatability. How do I put it? The interpersonal relationships that Peter Parker has are so simple and so domestic that it's a very fun dichotomy to play that big, massive spectacle alongside those very small moments. There are very real moments and, in a very small way, there's a small, intimate little indie movie at the heart of Spider-Man. That was my access point. In the trailer, you want that spectacle and you want that energy because I think there's an expectation surrounding that, but as we get closer to the release, there will be scenes that show the more intimate parts of Spider-Man and show where the heart is. Q: The first Sam Raimi film had a lot of Peter discovering his powers for the first time. Do you get to have fun with that again? Webb: There's elements of that. Listen, I wanted to do things differently. If we've seen the origin of Spider-Man, maybe we haven't seen the origin of Peter Parker. There are certain iconic elements of Spider-Man that I felt obligated to honor. There are some exploratory phases. But, again, I wanted to build something with a different tone and a different attitude and to do things in a little more of a practical way, especially at the beginning of the movie. There are elements where we spent a lot of time engineering and designing sequences that existed within the camera that we just shot practically with him swinging on these chains to help create that sensation and feeling of joy and fun, which is always a great part of these movies. Q: Can you talk about your approach to Peter here? It seems like he becomes this more animated version of himself when he's in the costume. Webb: That's something from the comics that I've always been really a fan of. Humor's a tricky thing because it's always very subjective. Everything in this movie, the first domino, is Peter getting left behind by his parents. I thought to myself, "What does that do to somebody? How does that change your view of the world?" To me, that creates a little bit of a level of distrust. It's a brutal thing to have happen to you. That's, to me, where he gets that outsider status. Then there's a sarcasm that comes from that and a quippiness. I think you guys have seen some of the car thief scene where that attitude comes out. That, to me, is generated from this chip on his shoulder. He's a little bit mean. He's a little bit snarky, but that’s an attitude that we can all understand and relate to. I think it comes from a real genuine place. That was fun to explore the humor, but my point is that the humor comes from a very human, real, emotional place. It’s not just slapped on. Q: Can you talk about casting actors like Denis Leary and Sally Field? Webb: Denis plays the authority figure that he has made fun of for his entire career. When you cast someone like Sally, they come with a certain level of awareness and real, genuine affection, which I think, for Aunt May, is an incredibly important thing to have. We all love Aunt May, but I wanted to create a tension between Aunt May and Peter because, once again, what is the reality of the situation? God, I wish I could show you some scenes, but I don’t have them with me. I thought, what would happen if you were someone who was in charge of taking care of a kid who has had a lot of tragedy in his life and he goes out late at night and comes back and he's f---ed up? You would be concerned. If he's got bruises on his face, what happens in that moment? That can create some tension, but you want there to be love there and that is what someone like Sally Field gives. The other thing about Denis Leary is that we all trust Denis Leary. He's got this attitude, but we love him. In this movie he puts pressure on Peter Parker. He's on Spider-Man's case. But you understand him. Good drama comes from competing ideas of what's good, right? People have different ideas on what that is, but if you put that together and they collide there is an honest difference in opinion. Then there's something really interesting that happens there. I wanted to explore that as much as possible. Q: There is a shot of Spider-Man swinging in the trailer where his foot comes off the screen and it looks like it comes significantly closer than most 3D films. How did you accomplish that? Webb: It's a matter of convergence. Again, the movie I designed is in 3D and that sequence that that comes from is later on in the film. You know, James Cameron was incredibly generous with me early on. He likes to have things play with depth. He wants you to see depth. Like if [the screen] is a window and everything you see is behind there. That is what is fun about it. The jungles of "Avatar" are really a great example of that. I liked pushing the 3D a little bit further so it will come out at you. I remember, as a kid, watching "The Creature From the Black Lagoon" with all those things coming out at you, or "House of Wax." There was something fun about that and seeing an audience with kids reach out for something. There were moments that I wanted to exploit like that. That was one of those moments. That particular shot has many, many visual layers to it. We generated around a figure. Then we converged the screen level behind the character -- behind Spider-Man -- so his legs would come out. Then we made him a little bit more in focus so you could feel a tangible sense of him and reduce the motion blur. It feels more tactile. Then in that shot, in particular, if you notice, when a subject violates the edge of the screen, it corrupts the illusion. You notice that it's not really real. So we designed it so it would exist within the barriers of the screen and it’s not crossing out the screen. That helps with that notion that it can come out at you. That's another one of those layers. The other thing is in the movie, you sit on it longer. That's the other part of letting that feel that it is coming into your space. Q: In the comics, Uncle Ben's death is really the catalyst for Peter becoming Spider-Man. From the trailer it seems the search for the truth about his parents is the catalyst. Webb: The first domino in the story is the parents. He goes out looking for his father and finds himself. That's my tagline. But Uncle Ben, of course, and his death... well, you have to see the movie! But, there's three elements that Marvel was very protective of and I think are very important parts of the Spider-Man origin story. Uncle Ben's death transforms him and has a huge impact on him. That's an incredibly important part of the mythology. I would never subvert that. That's all I'll say about that. Q: Can you talk about casting Martin Sheen in the role? Webb: [Big smile] That was so cool. That was awesome. It was a dream. In between takes, he told stories about Terrence Malick, about "Apocalypse Now" and about Fellini. It was spectacular. That was one of the really joyful parts of making this movie, getting to work with Sally Field and Martin Sheen and Denis Leary. It was so cool! They’re such pros and, again, like with Martin Sheen, you think about President Bartlett. He has that sense of benevolent authority and there's something else that's important in terms of the dynamic. I wanted to explore Peter's relationship with his absent parents. Ben and May are street-wise, blue collar people, but they're not scientists. Peter has this incredible scientific ability which creates a little bit of a gap between him and Ben and May. I thought that was a really interesting thing to explore. What Martin was able to do was to embody this blue collar guy. There was some fissure, some break between the two that was developing. Even though there was a great love for him, he knew he wasn't the father. He wasn't Richard Parker. That crack in Peter's world, that missing piece in his life, was a fun thing to start off. Q: You mentioned the romance part of it earlier. Did you feel any pressure to deliver one of those iconic Spider-Man kisses? Webb: It's hard to compete with that first Spider-Man. So, that wasn't my primary objective. I wanted to make a movie where it's about the chemistry and that's the thing you rely on. Those things can happen, but I didn't want to use that language. I wanted to create a language of my own. Q: There's been a rumored running time online that suggested the movie might be a bit leaner than previous Spider-Man films. Has a final cut been delivered already? Webb: Yeah, it's right around two hours. There's something on some website that said an hour and thirty minutes or something like that. No! [Laughs] Every once in a while, it's really interesting because you hear people talk about information that gets out and sometimes things come up and you're like, "What are you talking about?!" That's one of those things because I just don't know where that came from. Q: Outside of the main story, how much of a global view do we get of Spider-Man's universe? Webb: We spent a lot of time with the writers, coming up with a backstory and a world that could hold different stories if the series is ongoing. We plucked things from different versions. We took some stuff from "Ultimate." We took some stuff from the old "Amazing Spider-Mans" and then we invented certain other things to make it interesting. Like, Gwen Stacy, for example, I looked more towards "The Amazing Spider-Man" because I just like the texture of her character in those than in "Ultimate." I thought it was more appropriate for Peter. Whereas the body language in a lot of the [Mark] Bagley art I thought made really great reference points in terms of creating the physical identity of Spider-Man. Q: Have you been involved in the scripting for the second film? Webb: I've been so deeply immersed in this one that I haven't really even touched anything. There's talk, or whatever, but it's all just talk. A lot of that just has to do with schedules. I literally have been spending eighteen hours a day editing the movie, so I can't give you any interesting scoop there. I wish I could! Q: Do you have any thoughts on this CinemaCon talk about shooting in forty-eight frames per second? Webb: I didn't get to see that, but I have absolute faith in Peter Jackson. I think he's an incredible filmmaker and I feel like it's really important to support experiments. It's really important to try new and different things and I really want to honor the theatrical experience and make that better. We have to be patient and see what happens. It's a very, very hard thing to make movies, especially in an environment now where everyone wants to have an opinion on something that it's hard on any level to have will or support or curiosity about things. I'd just be curious to see it. I haven't seen it and so I can't really comment on it. Anything to help make big movies interesting and fun to watch, though. I'm all for trying new things.